If you’ve switched to Ubuntu from Windows, it may take some time to get used to the new and different interface. However, you can easily incorporate a familiar Windows feature, the Taskbar, into Ubuntu to make the transition easier. A tool called Tint2 provides a bar at the bottom of the Ubuntu Desktop that resembles the Windows Taskbar. We will show you how to install it and make it start every time you log into Ubuntu. NOTE: When we say to type something in this article and there are quotes around the text, DO NOT type the quotes, unless we specify otherwise. Press Ctrl + Alt + T to open a Terminal window. To install Tint2, type the following line at the prompt and press Enter. Type your password at the prompt and press Enter. The progress of the installation displays and then a message displays saying how much disk space will be used. When asked if you want to continue, type a “y” and press Enter. When the installation has finished, close the Terminal window by typing “exit” at the prompt and pressing Enter. Click the Search button at the top of the Unity bar. Start typing “startup applications” in the Search box. Items that match what you type start displaying below the Search box. When the Startup Applications tool displays, click the icon to open it. On the Startup Applications Preferences window, click Add. On the Add Startup Program dialog box, enter a name for the startup application. This name displays in the list on the Startup Applications Preferences window. Type “tint2” in the Command edit box, enter a description in the Comment edit box, if desired, and click Add. 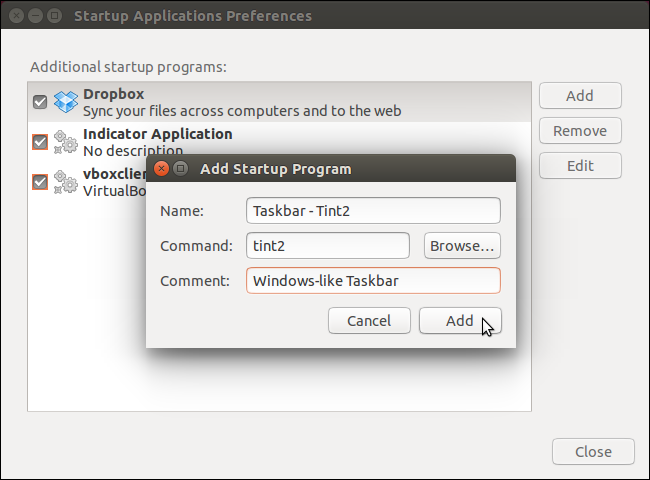 Tint2 is added as a startup program and will start every time you log into Ubuntu. 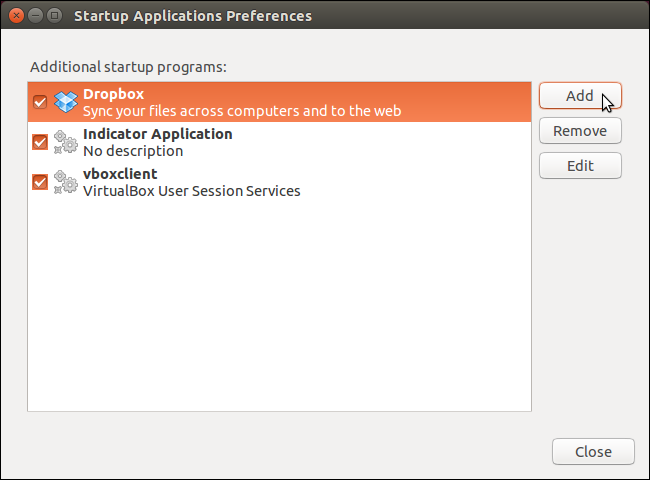 Click Close to close the Startup Applications Preferences window. Log out and log back in to make the Taskbar available on the desktop. You do not need to reboot the computer for this change to take effect. Now, when you minimize a program, an icon for it displays on the Taskbar at the bottom of the screen, just like the Taskbar in Windows. 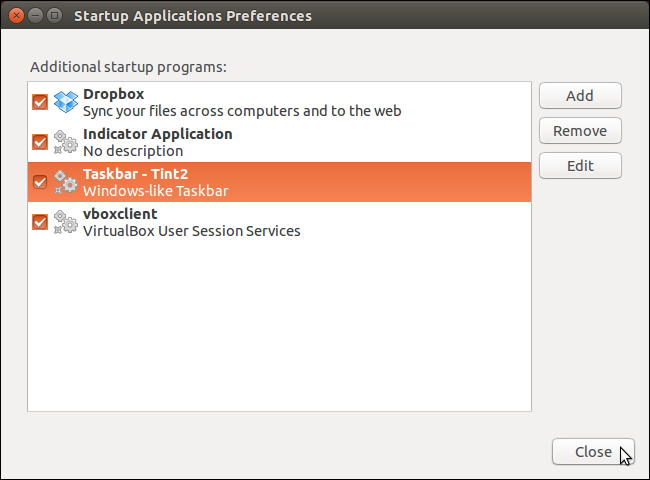 If you decide that you don’t want the Taskbar to display every time you log into Ubuntu, you can uncheck the Tint2 startup program on the Startup Applications Preferences window. You don’t need to delete it from the list.